Kristy's Hibiscus diaper cake is a bright, fresh diaper cake design that is so attractive! Kristy explains how she made it, what she used and where she got the ingredients. 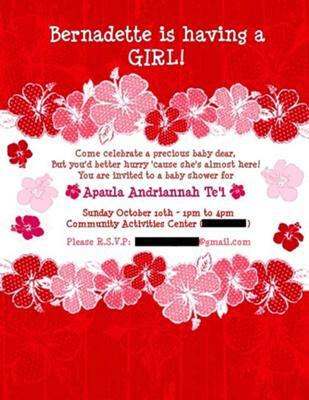 She also included pics of her invitations and thank you cards as well as descriptions of her decorations. Kristy really outdid herself and it definitely shows! Kristy, thanks for sharing your stylish ideas! Share your baby shower ideas right here! 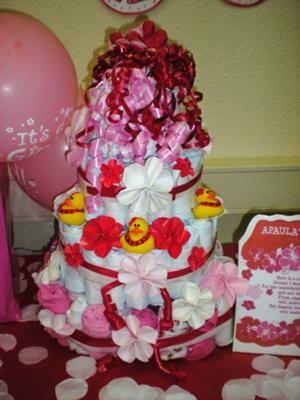 I wanted to make a very one-of-a-kind diaper cake for my dear friend who is Samoan and her favorite color is red. I was unable to find a craft store anywhere near where we are (we are stationed in Germany) so I decided to make my own! The flowers were very easy to make, using just tissue paper, wire & tape. I also made them is different sizes and used them all over the room as decorations. And of course some of the guests wore a flower or two in their hair as well. I used a 72-pack of diapers, and the entire bottom layer is made up of onesies. The onesies not only helped make the cake bigger, but also added more color and made it interesting. Each onesie and each diaper was rolled into rubber-bands, and each cake layer is held together with clear packing tape. The tape was covered up by the ribbon, so the cake was very sturdy and easy to transport. 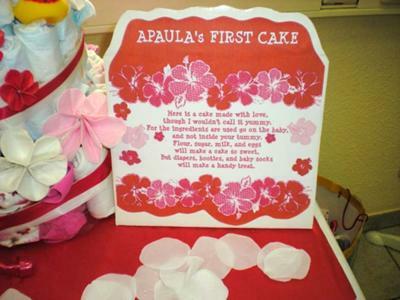 I found the diaper cake poem online and designed it to match the invitations I made. In sticking with the Samoan theme, I made candy leis as party favors for each guest. 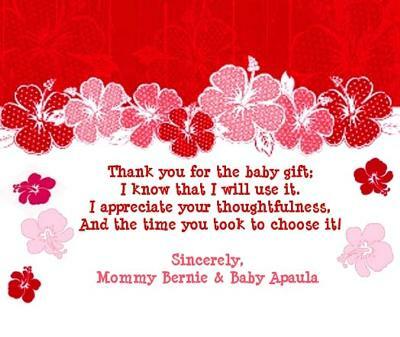 The leis also had a thank-you poem attached to them, which matched the design of the invitations as well. Also I made a baby-name banner to match the theme.